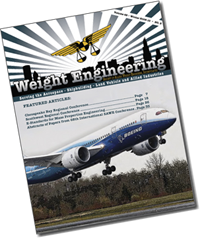 Weight Engineering - International Journal is currently published three (3) times a year and runs full page (8½” x 11”) or half page (8½” w x 5½” h) ads either in black and white or color and business card size (2” w x 3½” h) ads in black and white only. All material must be supplied electronically (e-mail, CD readable by Macintosh, or disc) in TIFF, PDF, or EPS format. PDF files should be created using the “Press Quality” settings, this will produce a high resolution (300 dpi) PDF suitable for offset printing. 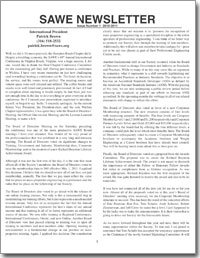 If the page has bleed, the PDF needs to be created with bleed and marks. All fonts and images must be imbedded. If EPS files are supplied, all fonts should be outlined and saved as either grayscale or CMYK. High-resolution graphics should always be provided and saved as TIFF files, not as JPEG or PICT files. TIFF files contain more information and produce higher quality images. SAWE Newsletter accepts only black and white job opportunity advertisements. The job opportunity ad consists of a company logo or banner and up to an 8½ x 11 page of text. SAWE International Website accepts job opportunity ads but there is no size limit on the text file (within reason). File Formats: GIF, JPEG, PNG. Flash advertisements are not available at this time. Animation: Cannot exceed six (6) seconds in length. No looping. Target URL: Must be live at the time of submission to SAWE. 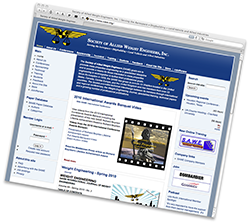 Banner advertisements appear on SAWE front page (http://www.sawe.org) only. Banner advertisements are displayed randomly on the home page. The frequency that an ad is displayed will depend on the number of advertisers on the SAWE website. Ad badges appear in the right border panel. Ad badges appear on every public page except Conference pages. The material must be appropriate for public dissemination. Information shall NOT contain government or company proprietary data. Advertisements cannot mislead the user. For example, they may not mimic or resemble Windows/Macintosh/Unix dialogue boxes, error messages or the like. Banners may not contain graphics that simulate interactivity (i.e., drop down menus, search boxes, and the like) without that functionality truly existing. All advertisements will be reviewed by SAWE and are subject to approval by SAWE before placement on the site. All Journal ads run for a full year (currently three issues). If you are interested in advertising in one or more of the publications of Society of Allied Weight Engineers, Inc. (SAWE), please contact the International Vice President/Publications, Robert W. Ridenour.